When it comes to home or commercial improvements, natural stone is a great investment! You can use natural stone for a variety of indoor and outdoor applications. With simple care and maintenance, your natural stone can last for a very long time. Before you get ready to clean natural stone, it’s important to know its composition. There are two categories it can fall into; siliceous stone or calcareous stone. Siliceous Stone is primarily composed of silica, another name for quartz. It’s very durable, easy to clean, and acid resistant. The most common types of siliceous stones are used for kitchen applications. Well-known types of siliceous stone include granite, slate, quartzite, soapstone, and sandstone. Calcareous Stone in comparison, is very sensitive to acid. 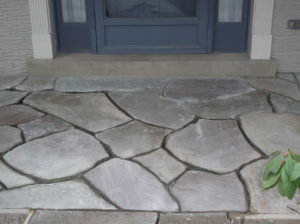 This stone is composed of calcium carbonate and should be cleaned with different cleaning products than siliceous stone. Common types of calcareous stone include limestone, travertine, onyx, serpentine, and various marbles. This type of stone is commonly used for tiles and floors. The beauty of using natural stone is that it never goes out of style. Follow our complete list of dos and don’ts to preserve the timeless look of your natural stone! DO use the right cleaning products: Many people are not aware of the chemicals contained in most household cleaning products. Popular cleaning solutions like blue Windex contain ammonia. These types of acidic solutions can lift the protective sealant of your granite leaving it exposed and vulnerable to stains. Before cleaning, check with your natural stone installer or local natural stone expert to ensure you’re using the right product for the job. DO use coasters for drinks: Just like cleaning products, citric or alcoholic beverages can damage your stone. Do use cutting boards: While granite surfaces are hard and resistant, you will want to avoid cutting citrus fruits such as lemons or even tomatoes. Their acidic content can damage the sealant on your natural stone, and you can also damage your knives. DO dust your natural stone surfaces regularly: Dust accumulates on every surface, and natural stone is not the exception. To guarantee your natural stone always looks its best, make dusting part of your weekly cleaning tasks. DO clean up spills as soon as they happen: While the sealants are there to help protect the stone from getting stained, they will not be able to protect the surface if a corrosive substance is left for a long period of time. DO use soft brush bristles, cloths or sponges to clean your stone: To avoid damaging your surface or the sealant, it is also very important to use soft products that won’t scratch the surface. Cleaning natural stone should be easy, so you probably won’t need to use strong actions or coarse cleaning utensils. DON’T use alkaline cleaning agents: This type of cleaning agent contains bleach and ammonia. These products are frequently used for cleaning windows, mirrors, and other kitchen surfaces. DON’T use vinegar or general-purpose cleaners: Many people use vinegar as part of DIY cleaning solutions. In the case of natural stone, vinegar and other general- purpose cleaners can be just as harmful as bleach or ammonia. DON’T put hot elements on top of natural stone: While most natural stones such as granite are not damaged by heat, the sealants might weaken if they are exposed to hot elements for an extended period. Don’t place beauty chemicals on top of your natural stone: Products such as nail polish remover, perfumes, or even hair-dyeing products can damage your surface. Don’t assume your natural stone is sealed: While it is very likely that brand new natural stone is sealed, it’s always important to check when you purchase. Natural stone that is a few years old, might need to be resealed. Making sure you follow these steps can significantly help you improve the lifetime beauty and value of your natural stone. We always recommend you share this checklist of important maintenance tips with the people who will be utilizing and cleaning the areas where there is natural stone. Sealants can help protect your natural stone, however, since this is a naturally occurring product, each block or slab used in construction is different. Once the slabs are cut, they can have a different composition and present different characteristics. The Natural Stone Institute of America recognizes sealants provide great benefits for natural stones, but they also warn some sealants have been known to react poorly to different cleaning products. If you need assistance with a natural stone project in the Pittsburgh area, make sure you contact the experts at Cirigliano Natural Stone & Masonry.